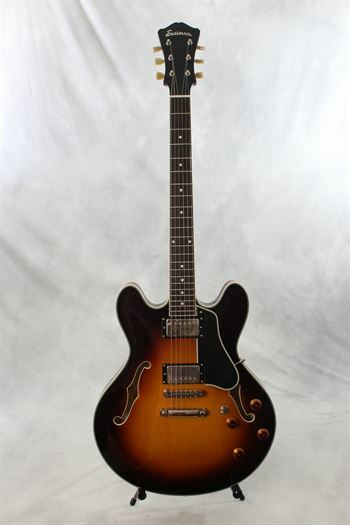 Eastman Strings (new) T386 Thinline Electric Sunburst - Mandolin Brothers, Ltd.
#10155172, with hard shell case. A full-size 16” thinline. Laminate Maple Top, Laminate Maple back and sides. This is versatile and responsive, with plenty of tone and attitude! Dual Kent Armstrong Humbucker Pickups.